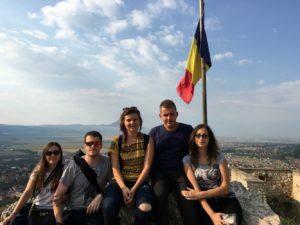 Traveling to different countries made us realise that we haven’t visited our own country that much so we decided it is time to be tourists in Romania. We already knew that staying in one place is not an option so we planned a road trip to different regions of the country. We flew into Bucharest to visit my sister and friends and since Cristi has only been through Bucharest, I decided to show him around a little bit. We started our day in the old city centre which is the liveliest place in Bucharest. The narrow, paved streets are filled with cafés, restaurants, bars and clubs. Here you can find the Macca-Vilacrosse passage, a glass-covered, arcaded street with several cafés and bars. 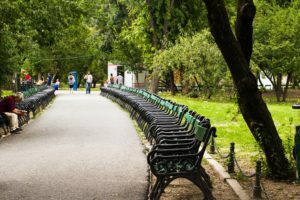 Next stop was Cişmigiu park, the oldest public park in Bucharest. Amongst others, there’s a lake with rowing boats (or for skating in the winter) and an alley with a rose garden. One thing to keep in mind though – there are a lot of birds around. We continued through Piața Victoriei and the Athenaeum where brides and grooms were queueing up to take pictures. We went back to the old city centre to meet two of our Erasmus friends and catch up over a few pints, after which other friends joined us and we decided to go to a club, which went on until daylight. Next day obviously started in the afternoon for us – we went for a few drinks back to the old city centre – not as much as the previous night though, since we had a train to catch early next morning. After spending two days in Bucharest, it was time to head on and start the road trip. We grabbed a cab to the train station early on Monday morning. Now usually, we try to get public transport whenever possible, but I have to mention that cabs are extremely cheap compared to other places we travelled to – approximately 1.39 RON/km. We took the train to Braşov, arriving around 9, where Lia was already waiting for us on the platform – this was her 5th trip with us – out of many more to come, hopefully. Outside the train station we met Brigi and Zsolti. 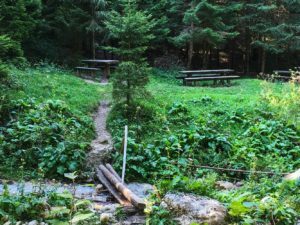 We had some peaches, gathered by them from their back yard (they had a full crate in the car) and decided that our first destination will be “Cascada 7 scări” – which translates to Seven stairs waterfall. It is quite a nice hike, not too strenuous. Takes about an hour from the road to reach the cabin, where you have to pay an entry fee. There are some picnic tables over here, which you can take advantage of. 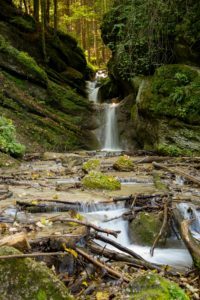 After the cabin, there is another hike until you reach the base of the waterfall. From here you have to climb (guess how many?) 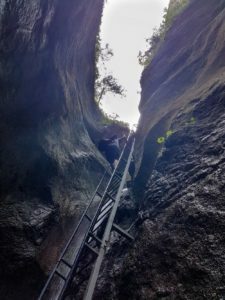 seven vertical ladders, with the longest one being 14 meters in height, and it runs parallel with one of the waterfalls, meaning you get quite a bit of splash as you go up and your hands will get cold on the wet, metal ladder – it is mountain water after all. I have to add here that although it seems scary at some points, the ladders and platforms seemed quite well maintained and pretty safe. After climbing the ladders, there is a hike to the right that takes you around and back to the cabin again. We stopped for a short lunch here at the picnic tables before continuing back down to the main road. 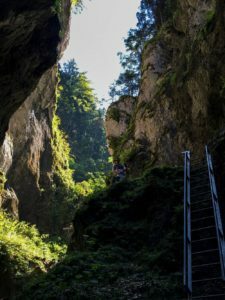 The whole hike takes approximately half a day, but there are some other marked paths after the ladders that you can take, if you decide to spend some more time in the nature. Our next stop was the Râşnov citadel. This citadel was built between 1211 and 1225 on top of a hill by Teutonic knights. Entering the citadel walls, there is a winding road that takes you up to the main building, road that posed an awesome opportunity for photographs. From the top building there is an excellent view of the surrounding town and the forest behind us. We managed to snap some pictures just as some light was shining over the fields. With this achievement under our belt, we started heading down. Although the entire day was a bit cloudy, we weren’t expecting rain – which obviously happened, precisely as we reached the car. And it wasn’t just a bit of rain, it was heavy downpour. Luckily, we managed to get to the car. Five minutes later the heavy rain had already stopped. After having some snacks and some peaches, we carried on to Braşov. We went to our accommodation first, then decided to go into the centre for dinner. More often than not we use Tripadvisor to find good places to eat. We chose to go to “La Ceaun” for some traditional food and this place didn’t disappoint us. Lia insisted we have to see one of the worlds’ narrowest street – “Strada Sforii”. 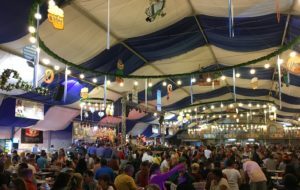 While trying to find it we stumbled upon a place where the town was organizing Oktoberfest. 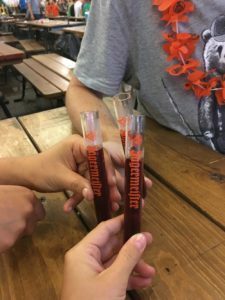 We ended up having some pints at Oktoberfest and some Jagermeister test tube shots, after which we went back to our accommodation to get some sleep for the night. 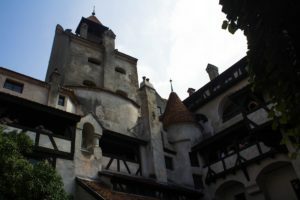 Next on our list was Bran castle which is also known as Dracula’s Castle among the tourists due to Bram Stoker. The entrance fee for the castle and the surrounding gardens is 35 RON. Depending on the day and time of year, you might want to get there early to beat the crowds. 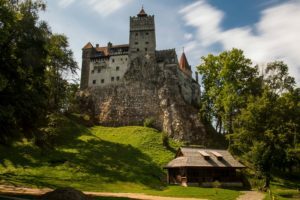 Some of you might be surprised to know that Vlad the Impaler, the historical character portrayed as Dracula, never had a significant role in the history of the castle, although he did pass several times through Bran. 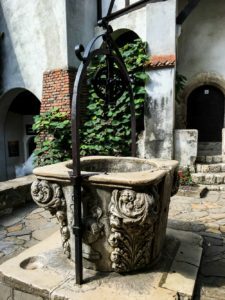 After going through the narrow hallways, small rooms and secret passage, we went down to the courtyard to the wishing well, and after to the castle’s estate for a few pictures of the castle. Afterwards we bought some snacks and ate some peaches (told you, full crate) since we had quite a bit of driving ahead of us. We drove down to Curtea de Argeş and then up into the mountains following the Transfăgărăşan Road. At the Vidraru Dam we made a short stop to take some pictures of the lake on the left and the valley from where we came on the right. We also looked for some toilets without any luck. After passing the Vidraru Lake, the road starts to become more winding as it climbs all the way to Bâlea Lake, with it’s highest point at 2042 meters. Top Gear did an episode on this road, naming it the best road in the world. 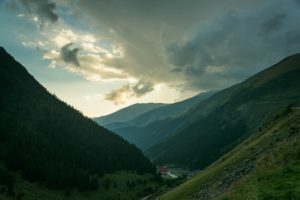 By the time we reached Bâlea Lac, the rain was pouring heavily outside so we decided to drive past it straight to our accommodation near Cârțişoara, the village that resides on the north side of the Transfăgărăşan Road, with the plan of returning next morning. We found a nice restaurant in walking distance from our apartment (the only one) where we wanted to stay on the terrace for dinner. Before we even got our food, the heavy rain started, and we had to get inside. Few minutes later, the entire restaurant went dark due to a blown fuse. It didn’t take long for the generator to kick in though. We waited for the rain to stop and then we went back to the apartment to sleep, looking forward to seeing the winding road and the lake next morning. I haven’t been to Romania yet, but having read your post i am really keen to visit. Loved the photos, put partcularly found the Scări Canyon and Bran castle interesting. Looking forward to reading the next road trip post ! Thanks Sam! The Canyon is indeed a great hike. The next road trip post is not far away. I love that you were tourists in your own Country, but what a fabulous country you were born in! 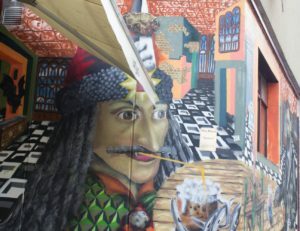 I particularly enjoyed the street art in Bucharest of our favourite villian we love to hate and as for Scari Canyon, that would definitely be scary for me walking up the ladders (I have an irrational fear of heights and ladders!) but I do love waterfalls so it would have been worth it! 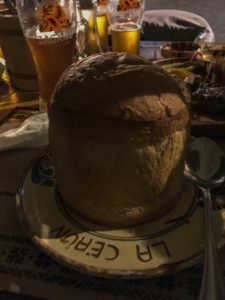 Your Brasov experience sounds fabulous and rather random … wasn’t expecting Oktoberfest and jagermeister shots but I would have enjoyed that!! Thank you for sharing your local tourist trail with us! Thanks Angie! Yes, the Oktoberfest was quite random, and quite a nice surprise. And with regards to the canyon – yes, it is worth it. I love Romania and it’s great to see you exploring more of your own country. 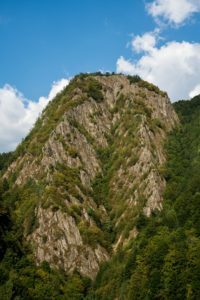 While I’ve visited Brasov, Rasnov, Bran and Bucharest I hadn’t heard of Scari Canyon before and it looks wonderful. 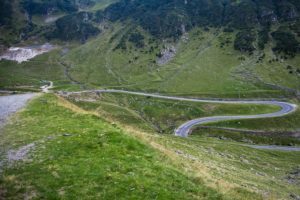 I feel I missed a lot of Romania’s nature so would love to see it when I go back, plus the Transfăgărăşan Road. Romania is definitely an underrated country to visit. Thanks David! The Canyon is a great place for a bit of nature. And the Transfăgărăşan is a must – keep in mind though that it is closed during the cold season. So this is probably weird but I’ve had a fascination with Romania ever since I was a little girl watching Olympic gymnastics. I haven’t been yet but it is definitely up there on my bucket list. And your photos make me want to go even more. Thanks Allison! It should be on all travelers’ bucket lists, with plenty of castles, cities, sights and for the most part, untouched nature. Absolutely gorgeous photos! You have a good eye on catching the moments! I have a good friend from Romania and he has always inspired me to go and see his country for himself. I have done a little research already and your post is a welcome addition to my knowledge base. I have seen the episode from top gear that you mentioned and would love to drive on that winding road myself. And these ladders next to the waterfall in the canyon are mind blowing! I would be so scared, but I would totally do it anyway!! Definitely going to Dracula’s castle too! And can’t wait to see these mountain views! This has made me all excited now! Thanks for sharing! Thank you Kreete! We are happy that our post about Romania inspired you. It is definitely a country worth visiting. If you ever decide to go and you need some inside knowledge, let me know and we’ll be more than happy to share. Looks so intriguing and lots of history to learn. I would love all the hiking, waterfalls, and then there’s the castles, yes. Friends of mine went awhile back and said it is a must visit so on my bucket list! You took some great pictures too! Thanks Lisa! 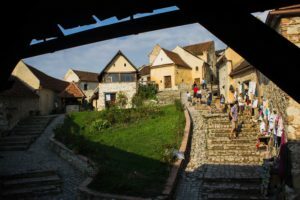 Romania should be on more travellers bucket lists, as there are numerous things to do and see. Ugh, wow. I’m definitely in love with Romania now after hearing about all the amazing places you went! Isn’t being a tourist in your own country/city so amazing? The waterfall and the castle are my favorite places in your post. And your photos are so incredible! Romania is really becoming a strong place we may go soon. 🙂 Can’t wait to see part 2 of this post! Thanks Anna! Tourism in Romania is indeed becoming more and more popular with travelers across the globe. If you ever decide to go and have a few questions, let me know and I’ll try answering them. Thanks Garth! 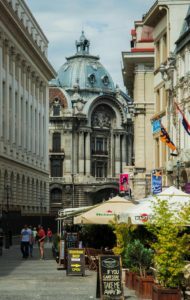 Bucharest is one of my favorite cities and I am always happy to go back to it, but there are several other cities that are worth a visit. Thank you Barry! It’s funny how you can take for granted your home city or country, missing out on great places around the corner. Also, the 7 Scari Canyon is indeed a great experience. 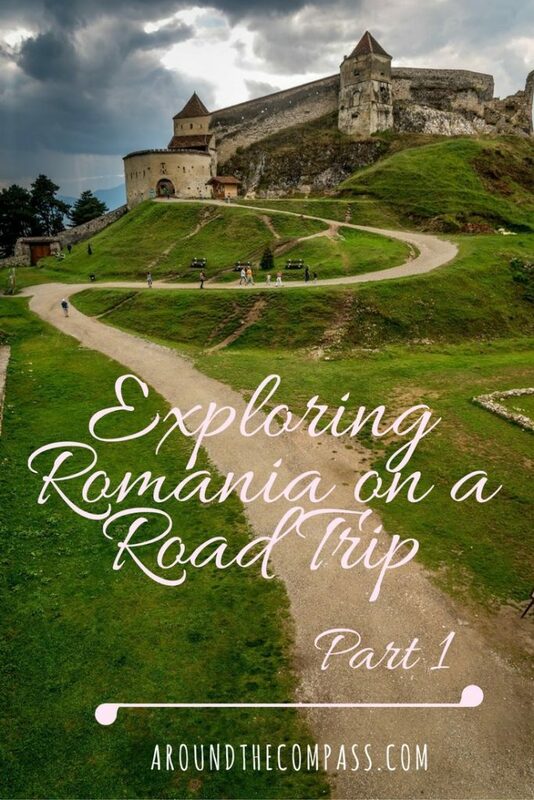 We loved reading your article about your Road trip in Romania as we found full of great information. It seems so beautiful and your pictures made us want to be in Romania right now. Patrick has been to few places in Romania but I haven’t yet! 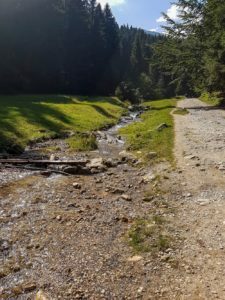 Where are you going exactly for the part 2 of your road trip in Romania? Your pictures are great by the way, they are really inviting and magical. If we end up going to Romania, we will have to check this post again! We are travelling for a year next year so who knows we might end up in there in 2017. Your post and your pictures definitely convinced us to go! Keep up the great work 🙂 When are you posting the part 2 of your road trip? Thanks Cecile! We will be posting the second part this weekend. 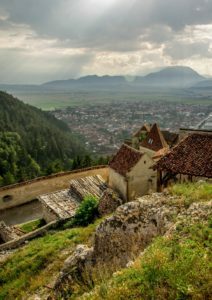 Romania is a place that deserves to be taken into consideration for travelling to, and you will not be disappointed. Romania looks so beautiful. fairy tale castles, charming towns and awesome natural beauty. 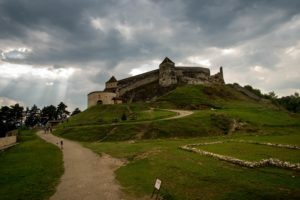 I do feel Romania has been underrated as a destination and overshadowed by other European countries. We do not see many posts about Romania as well. This was a refreshing post that has provided some valuable insights into this lovely country. I’m loving your blog! 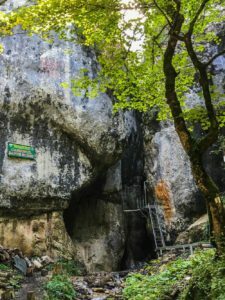 I just booked my family (me, husband, 7 year old son and 1.5 year old daughter) on a trip to Romania this coming June. 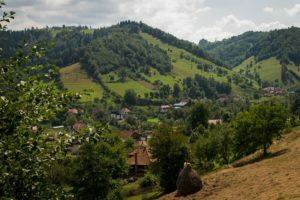 We are DIY travelers that love to get off the beaten path and explore, and we were so drawn to the small towns and countryside in Romania! We have 9 nights there, although we don’t fly into Bucharest until 11pm that first night. I’m wondering how long you’d recommend staying in Bucharest? To be honest, I was planning on only spending that first night before driving to Brasov the following day. But now I’m wondering if we should spend 2 nights in Bucharest? 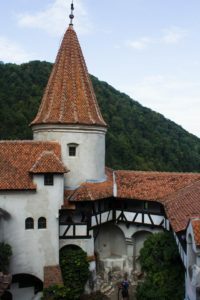 I was roughly thinking of spending 3 nights in Brasov (doing day trips to Bran/Sinaia and the fortified churches), 2 nights in Sighisoara and 2 nights in Sibiu before returning to Bucharest and flying to England for a week…If it were just my husband and I’m sure we could pack a lot more in, but with young children we don’t want to be moving around too much, and would just like to soak up the scenery and culture. I’d love your feedback if you have time! Thank you! I would recommend staying in Bucharest as well for a day, if you enjoy architecture and parks. One noteworthy thing is the “Casa Poporului”, the second largest administrative building after the Pentagon. 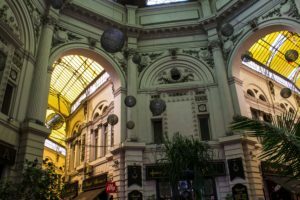 If you arrive late in Bucharest and not renting a car on the same night, look out for cab scams. They have their tariff printed on the door, and in any case it should not be more than 2 RON/km. 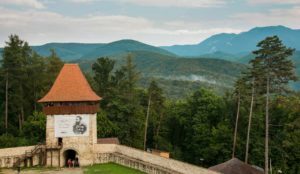 Near Brasov, make sure you visit Bran, Peles and Rasnov (there is a dinosaur park as well near Rasnov – might be worth it for the kids). 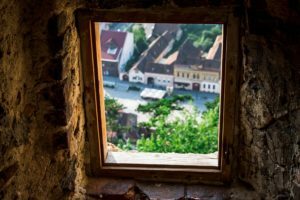 While in Sibiu, make sure you visit the Clay castle and the Corvin castle. Check out our Part 2 for more info, and let us know if you need anything else. I’m off to find part 2 of your trip report!